Steamed sponge for dinner? Sounds crazy? 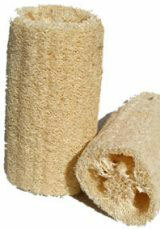 We’re talking about luffa cylindrica, an exotic plant that’s been around for over a thousand years. It’s also known as a dishcloth or rag gourd, and sometimes called Chinese okra (the spelling also varies – luffa, loofa, loufa, or loofah). In varying shades of tan, round and about a foot long, it looks like – and works like – a sponge. Only it beats any of the synthetics for scrubbing – whether scrubbing dishes, your car, or people. It seems to have just the right texture, leaving skin with a nice clean, tingly feeling. Luffa plants are less hardy than cucumbers or squash and should not be planted until you are sure there will be no more frost. To gain time, you can soak the small, flat black seeds overnight, then plant two or three in individual 3″ or 4″ pots. Keep them in a protected place. As soon as they germinate, get them into the light and keep them well-watered. When they have grown to about two inches, thin to the most sturdy-looking plant. When seedlings are about three inches or so high, you can transplant. Water thoroughly the night before, and plant on a cloudy day or in the evening. Shade them from the sun for a couple of days – don’t let them dry out. Like cucumbers, they like a light soil, well supplied with humus and nitrogen. If you have a heavy soil, amend with Gardner & Bloome Soil Building Compost before planting. Fertilize with Dr. Earth All Purpose 5-5-5 and – later on – fish emulsion. Plant about a foot apart. 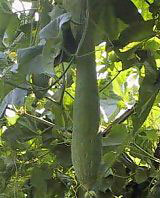 Luffa is a vine, growing to 15 feet or more, and needs a trellis or fence or enough space to wander in. 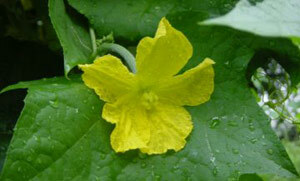 It’s a pretty plant with lemon-yellow flowers followed by light-green fruits looking something like zucchini. They are edible only when immature, so if you want to try them for eating, pick young ones. Cook them as you would zucchini. Keep the ones you intend to use for sponges off the ground with boards, a trellis, or something else that will keep them dry.